Welcome to Marvel Strike Force Heroes page. This is the full description of MSF Iron Man stats, skills and abilities. Iron Man is an Avenger Blaster with highest base damage in the game. His first skill delivers heavy damage and has a chance to hit adjacent targets. His second skill hits all enemies for a medium amount of damage and can hit even harder if Captain America is in a team. Iron Man ultimate inflicts the highest damage in a game to a single target. In addition, Iron Man has a passive ability to increase critical chance of him and his allies. Iron Man main weakness is his speed but nevertheless, he has the highest damage output in the game especially if he is in the team with Captain America. Obtaining Iron Man is a really hard task because his price is 310 shards which can be obtained only through the legendary Iron Man Event. What are Iron Man's Stats? 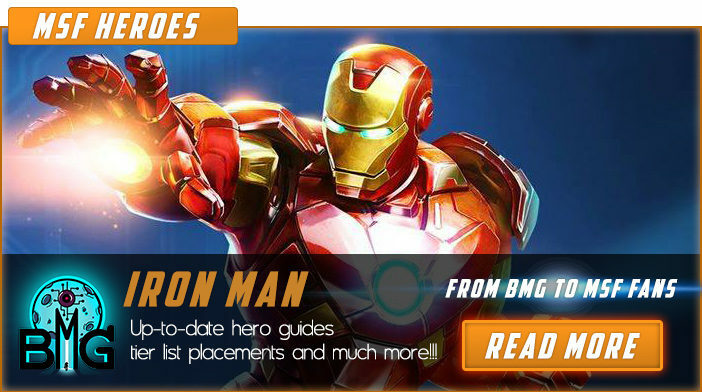 We hope that you enjoyed the description of MSF Hero Iron Man. For detailed information about other MSF Characters check our MSF Heroes page.